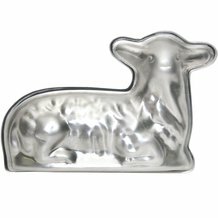 Our Easter Lamb Cake Pan is OUT OF STOCK, but we have ordered more! You are still able to purchase it now and we will ship it to you as soon as it arrives. Questions? Please call 1-800-438-5346 or email us at info@Lehmans.com. Celebrate an Easter tradition that dates back many generations in Europe and the USA alike. Our 2-piece cake pan makes it easy. 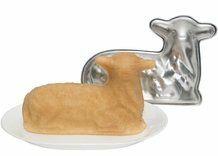 Simply pour your favorite cake batter in the bottom half, then place the top half on to bake an adorable, freestanding 3-D lamb. Frost, decorate and enjoy what's sure to be the crown jewel of your Easter meal. 11-1/4" x 7-1/2" x 3-1/2"
Note: Cake mixes may be used - see instructions included with pan. Hand washing recommended. 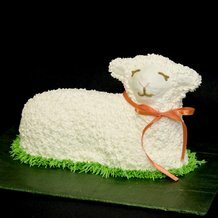 Click here to read about the Lehman family's Easter lamb cake tradition. I used this pan last spring - very cute. I used the recipe from the Lehman's Country Life blog (http://countrylife.lehmans.com/our-lamb-cake-tradition/) and it was delicious and held the shape perfectly, but it's good to know there are directions for using a box mix if I'm in a hurry. This was delivered on Good Friday. Worked like a charm. It came out great, just like this grandpa remembered these cakes but even better. Grandkids loved it. 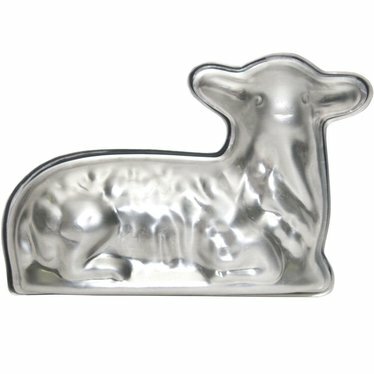 I purchased this mold last month just in time for my attempt at my first ever lamb cake. This one looked exactly like my grandma's (which is the main reason I bought it). It worked like a charm! My lamb came out smoothly with no problems (it did help that I greased and floured it like no other). ;0) Definitely worth it!